Curcumin nutrients (curcumin, demethoxycurcumin, bisdemethoxycurcumin) are usually poorly absorbed when taken by mouth. Phytosome proprietary technology solves this problem. In Curcumin Phytosome featuring Meriva® , each curcuminoid molecule is individually complexed with molecules of the vital cell membrane nutrient phosphatidylcholine (PC). By facilitating curcumins entry into human cells and tissues, PC gives this product superior bioactivity over non-phytosome curcumin supplements. The curcumin nutrient complex is unique for its diverse benefits to human health. Phytosomes are molecular complexes formed between individual curcumin molecules and molecules of phosphatidylcholine (PC).3 Curcumin molecules normally mix very poorly into water and so are poorly absorbed when in this medium. "1,3 Curcumins formed into phytosomes with PC disperse almost completely into water,1 and when taken by mouth are far better absorbed into the blood than are conventional curcumin supplements.3,4 In addition, the Phytosome technology also harnesses the additional health benefits of PC itself. 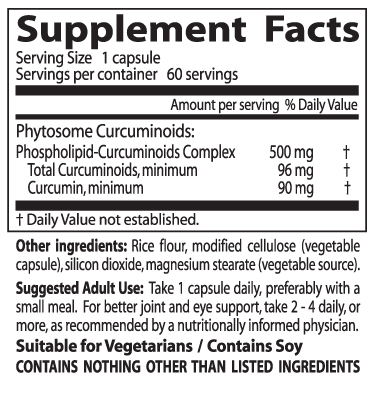 The Phytosome technology involves wrapping each curcumin molecule with one or more molecules of PC. This envelope of PC helps the bound curcumin molecule disperse in the water phase while shielding it against water damage. Researchers believe that once the phytosome supplement is swallowed, the unit phytosomes readily diffuse through the intestinal contents, facilitated by PCs excellent miscibility with water.6,7 After a phytosome arrives at an intestinal lining cell, the PC molecule readily merges with the outer cell membrane and the curcumin molecule passes into the cell interior. Subsequently the intestinal cells release the curcumins into the circulating blood, from which they travel to the other tissues. PC is a universal building block for cell membranes.8 PC is essential for assembling, maintaining and repairing the membrane matrix, which in turn ensures the structural and functional competence of the entire cell membrane system. Vital to all life processes, PC has been called a Vital Lipid for Life.11 Numerous experimental and clinical studies document that PC helps preserve cell membrane systems against toxic or viral attack.8 And as curcumin enters the cell it specifically binds to the PC in the membrane.10 This is strong indication that these two nutrients complement each others actions to fundamentally support cell membrane competence. The curcumins are potent cell membrane protectants. They are versatile antioxidants that help prevent free-radical damage from oxygen and nitrogen-centered oxidants.12,13 The curcumins inhibit free radical attack on the cell, whether on the DNA and genes, on the mitochondria that generate energy, or on the membrane system.13 Membranes are especially vulnerable to free radical attack, and the presence of curcumin helps guard them against destruction from lipid peroxidation.10,13 The curcumins protective capacities extend even beyond their antioxidant actions, as evidenced from their capacity to protect joint tissues against runaway destructive activity of the bodys immune system. For the rat study, rats were fasted overnight then were force-fed equivalent amounts of curcumin either as phytosome or non-phytosome material.4 Blood samples were obtained at 0, 15, 30, 60, or 120 minutes after feeding. The phytosome preparation showed superior curcumin absorption into the plasma, beginning at 30 minutes. For the period 0-120 minutes, curcumin was absorbed some 5.6 times better from phytosomes versus non-phytosomes. Further, the liver accumulated significantly more curcumin from the Meriva® phytosome versus the non-phytosome preparation. In a recent double blind human trial,14 Meriva® supported healthy joint function and down-regulated molecular triggers of tissue damage. The most favorable indicator of Meriva®s benefit in this trial was treadmill performance. After 2 months on Meriva®, the average distance walked at a brisk 3 kilometers per hour, with a treadmill incline of 10 percent, was significantly improved as compared to placebo. This impressive human finding on joint support was consistent with other positive findings from controlled studies with horses and dogs.15 In these veterinary studies, the identical phytosome preparation improved joint health and lowered TNF (tumor necrosis factor), a cytokine messenger molecule known to trigger damage to the joints and other tissues. The key to success in the human double-blind trial was Meriva®s measurably superior delivery of curcumins to the tissues.14 This trial also demonstrated that Meriva® could significantly down-regulate C-reactive protein (CRP), a clinically relevant indicator of whole-body health as well as joint health. C-reactive protein is produced by the liver and released into the blood, and highly-sensitive blood CRP level (hs-CRP) is increasingly employed as a biomarker particularly for cardiovascular health.20,21 Blood hs-CRP normally is very low in healthy individuals, but predictably becomes increased when the immune system is active against tissue damage.22 Substantial clinical research indicates that low blood CRP is consistent with relatively good health and conversely, that elevated CRP is a harbinger of impaired function.20-22 In the human Meriva® trial,14 those subjects who received Meriva® had a marked lowering of their elevated CRP levels after 2 months. This was a statistically significant benefit as compared to the placebo group, which experienced no appreciable lowering of CRP. Curcumin and its related curcumins from turmeric root have been a revered traditional cure-all for millennia.1 Modern science and clinical medicine has objectively verified a great many of these traditional folk applications. Now that the curcumins can be effectively delivered to the human tissues via Phytosome technology, their benefits observed experimentally are now available to all. For improved wellbeing and for optimal health long-term, Curcumin Phtyosome featuring Meriva® is the gold standard of curcumin dietary supplements. Hatcher H, Planalp R, Cho J, et al. Curcumin: from ancient medicine to current clinical trials. Cell Mol Life Sci 2008;65:1631-1652. Garcea G, Berry DP, Jones DJ, et al. Consumption of the putative chemopreventive agent curcumin by cancer patients: assessment of curcumin levels in the colorectum and their pharmacodynamic consequences. Cancer Epidemiol Biomarkers Prev 2005:14:120-125. Kidd PM. Bioavailability and activity of phytosome complexes from botanical polyphenols: The silymarin, curcumin, green tea, and grape seed extracts. Altern Med Rev 2009;14(3):226-246. Marczylo TH, Verschoyle RD, Cooke DN, et al. Comparison of systemic bioavailability of curcumin with that of curcumin formulated with phosphatidylcholine. Cancer Chemother Pharmacol 2007;60:171-177. Bombardelli E, Curri SB, Della Loggia R, et al. Complexes between phospholipids and vegetal derivatives of biological interest. Fitoterapia 1989;60:1-9. Alberts B, Johnson A, Lewis J, et al. Molecular Biology of the Cell (Fourth Edition). New York: Garland Science; 2002. Kidd PM. Phosphatidylcholine (Monograph). In: Czap K, Miller AL, Head KA, et al, eds. Alternative Medicine Review Monographs Volume One. Dover, ID: Thorne Research, Inc.; 2002:310-315. Hulbert A, Else P. Review: membranes and the setting of energy demand. J Exp Biol 2005;208:1593-1599. Barry J, Fritz M, Brender, JR, et al. Determining the effects of lipophilic drugs on membrane structure. J Am Chem Soc 2009;131:4490-4498. Vital Lipids Copyright © and TM Science and Ingredients, Inc., Laguna Niguel, Ca, USA, 2007. Jurenka J. Anti-inflammatory properties of curcumin, a major constituent of Curcuma longa: A review of preclinical and clinical research. Altern Med Rev 2009;14:141-153. Soni K, Kuttan R. Effect of oral curcumin administration on serum peroxides and cholesterol levels in human volunteers. J Physiol Pharmacol 1992;36:273-275. Belcaro G, Cesarone MR, Dugall M, et al. Product-evaluation registry of Meriva®, a curcumin-phosphatidylcholine complex, for the complementary management of ostroarthritis. Panminerva Med 2010; in press. Gaspardo B, Colitti M, Scaini C, et al. Transcriptosome modification of peripheral white blood cells after dietary administration of curcumin in osteoarthritic affected dogs. Plant & Animal Genomes XVIII Conference San Diego, CA, USA 2010; Abstract 787. Also data on file, University of Udine, Italy, 2010. Henrotin Y, Clutterbuck AL, Allaway D, et al. Review: Biological actions of curcumin on articular chondrocytes. Osteoarthritis and Cartilage 2010;18:141-149. Singh S, Aggarwal B. Activation of transcription factor NF-kB is suppressed by curcumin (diferuloyl methane). J Biol Chem 1995;270:24995-25000. Liacini A, Sylvester J, Li WQ, Zafarullah M. Inhibition of interleukin 1-stimulated MAP kinases, activating protein-1 (AP-1), and nuclear factor kappa B (NF-kappa B) transcription factors down-regulates metalloproteinase gene expression in articular chondrocytes. Matrix Biol 2002;21:251-262. Huang MT, Lysz T, Ferraro T, et al. Inhibitory effects of curcumin on in vitro lipoxygenase and cyclooxygenase activities in mouse epidermis. Cancer Res 1991;51:813-819. Emerging Risk Factors Collaboration, Kaptoge S, Di Angelantonio E, Lowe G, et al. C-reactive protein concentration and risk of coronary heart disease, stroke, and mortality: an individual participant meta-analysis. Lancet 2010;375(9709):132-140. Ray KK, Cannon CP, Cairns R, et al. Prognostic utility of apoB/AI, total cholesterol/HDL, non-HDL cholesterol, or hs-CRP as predictors of clinical risk in patients receiving statin therapy after acute coronary syndromes: results from PROVE IT-TIMI 22. Arterioscler Throm Vasc Biol 2009;29:424-430. Pearson TA, Mensah GA, Alexander RW, et al. Markers of inflammation and cardiovascular disease: application to clinical and public health practice. Circulation 2003;107:499-511.